Home / blog / 10 Benefits why you should live near nature? 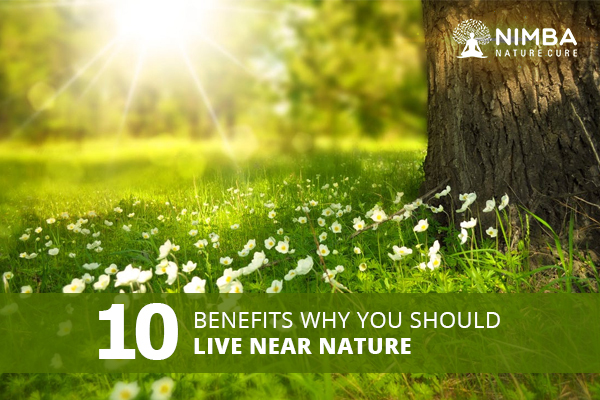 10 Benefits why you should live near nature? Freshness Unleashed: Green spaces provide the oxygen-rich air, fresh and healthy. Especially in the times of pollution menace, living near nature would keep you fresh with the pure air. Wellness of Mind: Crowded by the skyscrapers and technology, our mind might not have those edgy thoughts. The vivid colors and experience of nature can allow your mind to concentrate. Social Coherence: Not social networking of your profile, meeting likeminded people amid the serenity of nature, improves the levels of attachment and prosperity among citizens. Energized Body: Breaking off from the mundane lifestyle, a walk or exercising among trees is sure to boost your energy to unmatched levels, and improved optimism. Relief from Stress: Nature is where we belong, not in closed air-conditioned cabins. Nature has the power to streamline your thoughts and find the best solution, thereby relieving stress. Powerful Eyesight: as more and more people keep looking at their computer monitors through the day, the eyes’ health starts deteriorating. Looking at the green horizons resolves it. Fight the Diseases: Recent studies have observed the positive impact of nature on patients with deadly diseases. Nature motivates the patient in the fight against diseases. Better Immunity: Contrary to the popular belief, a stroll in nature allows the body to learn to deal with different infections, thereby better equipping your immunity to fight in the future. Mental Disorders: In case of ADD or ADHD patients, nature exerts a calming effect on the mind. The patients show reduced symptoms and improved calmness in green surroundings. Quality of Life: Spending more time in nature, also known as ‘Ecotherapy’, greatly improve the sleeping pattern and boosts the overall quality of life.